Aluminum foil is widely used in many sectors of national economy and people’s daily life because of its light weight, good sealing and encapsulation, but it is mainly used in packaging, electromechanical and construction fields. Aluminum foil can be classified according to its thickness, shape, state or material. Aluminum foil can be divided into thick aluminium foil, single zero aluminium foil and double zero aluminium foil according to thickness difference. Thick foil: Aluminum foil with thickness of 0.1-0.2 mm. (3) Double zero foil: The so-called double zero foil is the aluminium foil whose thickness is less than 0.0075 mm, which has two zero foils after decimal point when its thickness is measured in mm. When expressed in English, thick aluminium foil is called “heavy gauge aluminium foil”, single zero aluminium foil is called “medium gauge foil” and double zero foil is called “light gauge foil”. Aluminum foil with thickness less than 40 LTM is sometimes called light gauge foil in foreign countries, while aluminum foil with thickness greater than 40 BTM is collectively called heavy gauge foil. Aluminum foil can be divided into aluminium foil roll and aluminium sheet foil according to its shape. Aluminum foil deep-processed wool is mostly supplied in rolls. Only a few handicraft packaging occasions use aluminium sheet foil. Aluminum foil can be divided into hard aluminium foil, semi-hard aluminium foil and soft aluminium foil according to its state. (1) Hard foil: Aluminum foil without softening treatment (annealing) after rolling and without degreasing treatment, the surface is marked with residual Shantou. Therefore, the hard aluminium foil must be degreased before printing, bonding and coating. If it is used for forming, it can be used directly. (2) Semi-hard aluminium foil: Aluminum foil whose hardness (or strength) is between hard foil and soft foil is usually used for forming. (3) Soft foil: Aluminum foil softened after full annealing after rolling, with soft material and no residual oil on its surface. At present, soft foil is used in most applications, such as packaging, composite, electrical materials and so on. Aluminum foil can be divided into one-sided and two-sided according to its surface state. (1) One-sided glossy aluminium foil: double rolled aluminium foil, after coiling, one side is bright, – face is black, such aluminium foil is called one-sided glossy aluminium foil. The thickness of one-sided aluminium foil usually does not exceed o.025mm. (2) Two-sided aluminium foil: single rolled aluminium foil, two drawings contacted with rolls. 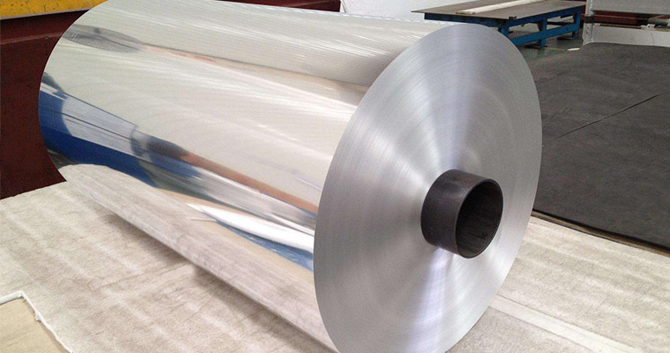 The two sides of aluminium foil can be divided into mirror two-sided aluminium foil and common two-sided aluminium foil because of the different surface roughness of rolls. The thickness of dihedral aluminium foil is generally not less than 0.01mm. Aluminum foil can be divided into plain aluminium foil, embossed aluminium foil, composite aluminium foil, coated aluminium foil, colored aluminium foil and printed aluminium foil according to the added state. Plain aluminium foil: Aluminum foil rolled without any other processing, also known as light foil. (2) Embossed aluminium foil: Aluminum foil with various patterns on the surface. (3) Composite aluminium foil: Aluminum foil and paper, plastic film, cardboard bonded together to form a composite aluminum foil. Coated foil: Aluminum foil coated with various resins or varnishes. Coloured aluminium foil: The surface is coated with a single color of aluminium foil. Printing aluminium foil: Aluminum foil, which forms various patterns, patterns, words or pictures on the surface by printing, can be a color, up to 12 colors. Tagged aluminum foil, Composite aluminium foil, double rolled aluminium foil, hard aluminium foil, heavy gauge aluminium foil, printed aluminium foil, Printing aluminium foil, thick aluminium foil. Bookmark the permalink.